Many homeowners have the mistaken belief that a problem with their garage door simply develops overnight. In the majority of cases, this is simply not true. 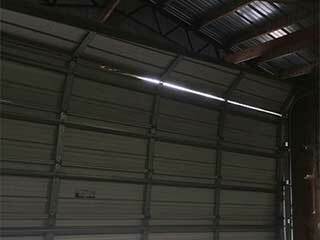 Due to the nature of this complex system and the many moving parts involved in its operation, your garage door and all of its parts go through a lot of wear and tear on a regular basis. There are ways, however, to detecting there's a problem before it manifests via a major malfunction. Some of the most frequently reoccurring issues are usually caused by failure to properly lubricate the moving components of your system. This can cause the garage door track, rollers or even its hinges and springs to emit a loud annoying noise while the door is in operation. Addressing this issue quickly can prevent more serious malfunctions from developing. This can gradually become more obvious as the door will no longer be able to close as effectively as it used to. This is usually caused by some form of obstruction that's preventing the door from closing or it could indicate damage to a garage door cable or pulley which should be quickly replaced. This can be the result of a gradual decline of one of the springs; especially if you also notice the door is banging shut. This issue should be addressed quickly before the spring deteriorates any further and breaks. Sometimes spring adjustment is all that is required, but this process is just as dangerous as replacement, so you need to call an expert. Your garage door opener should allow the door to open and close smoothly. If the movement becomes jerky, it could indicate damage or misalignment of a track. Check to see if the tracks are properly aligned with a spirit level and visually examine them for any dents, bends or damage. Minor damage can be manipulated back to the original shape by a professional technician. Misaligned tracks can have some fixings loosened and will need to be moved back into an aligned position. Taking the time to pay a little attention to your system can allow you to notice warning signs early and get the necessary repair work done before a major problem develops. Contact our experts at Garage Door Repair Portland to make sure your door isn't about to break down anytime soon.